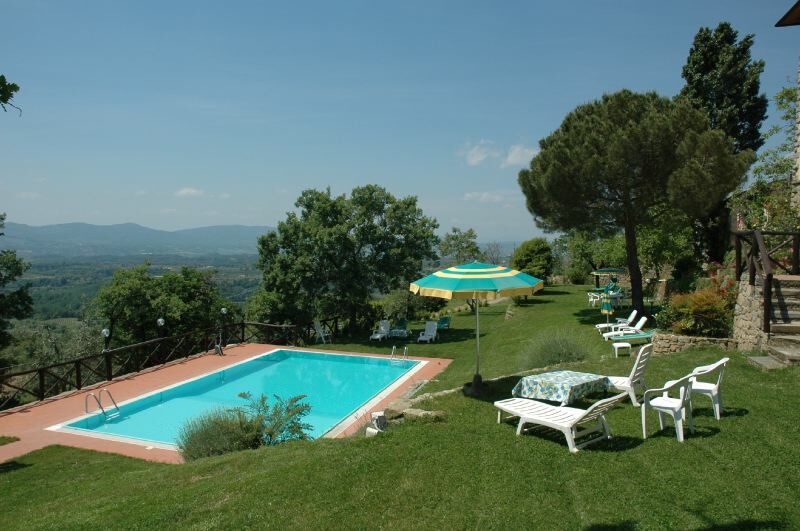 Villa la Capitata lies in a panoramic position in the hills south of Florence, close to the village of Pian di Scò, which is 2 km away. The house spreads out onto a large panoramic terrace where you can access both the main building and the four annexes which each have their own independent entrance. During the renovation all of the original characteristics of the old manor house, such as the terracotta floors and wooden beamed ceilings were maintained intact. The furnishings in the main building are mainly composed of typical Tuscan pieces from the end of the 1800s. The annexes have more modern furniture which are done in a typically local style. The villa has a dishwasher, satellite TV, stereo with CD player, central heating, internet connection Wifi, external laundry with washing-machine. The terrace is furnished with tables and chairs for outside dining and is ideal for relaxation or for sunbathing. Access to the private swimming-pool is via a short flight of steps which leads to the spacious external area, all perfectly furnished. La Capitata is in a secluded, quiet position. The owners deal with the maintenance of the garden and swimming-pool. Upon request guests can book a cooking service for the evenings, which is prepared in the professional kitchen below the villa (which may only be used by the cook). If you want you can even buy the olive oil and wine produced by the farm directly from the owners. You can reach a typical local food shop selling local products on foot (about 500 meters away) and in the nearby village of Pian di Scò you will find all the services you might need along with several restaurants. Nearby there are some lovely towns to visit: Reggello, Castelfranco di Sopra and many others, and also the beautiful mountain top at Pratomagno. Florence is 35 km away and can be reached in half an hour by car along the Florence/Rome motorway which is about 10 km from the villa. The Chianti Classico area and Siena are respectively 45 and 60 km away, and nearby are also some fashion Outlets where you can buy famous brand name clothes such as Armani, Gucci, and Prada. The villa spreads out around a large panoramic terrace and consists of a central building and of four annexes with independent entrances from the terrace. (VILLA) GROUND FLOOR: large living-room with dining-area and fireplace, kitchen with dishwasher, small office. FIRST FLOOR: four double bedrooms with bathroom with shower, two twin bedrooms, 2 bathrooms with shower. (Dependance 1) GROUND FLOOR: large living-room with corner kitchen, two double bedrooms, 1 bathroom with shower. (Dependance 2) GROUND FLOOR: living-room with corner kitchen, 1 double bedroom, 1 bathroom with shower. (Dependance 3) GROUND FLOOR: living-room with corner kitchen. FIRST FLOOR: 1 double bedroom, 1 bathroom with shower. (Dependance 4) FIRST FLOOR: living-room with corner kitchen, 1 double bedroom, 1 bathroom with shower. Paid on site in cash: Obligatory cleaning during the week: 3 hours a day, 3 days per week for a total of 70 Euros per week. Obligatory daily cleaning only for the solution with 22 beds. Additional beds cost (2 available): 100 Euros per week, to be paid on the premises.